You find strength when you’re at your weakest . . . When Sydney’s husband dies, she is dealt another devastating blow. He never changed his will and she is forced to leave the beautiful home they shared. On a flight from Paris to New York, an emergency landing forces her into the arms of Paul Zeller. The pair bond over a shared love of fashion, and before long they go into business together. But Sydney’s daughters are less than impressed by their mother’s mysterious new acquaintance . . . Offered a job at Paul’s high-street clothing chain, Sydney thinks her luck has turned. But when a scandal hits the company, it’s Sydney in the firing line. Humiliated, publicly shamed, destitute – Sydney hits rock bottom. There are only two choices: giving up or starting over. With the unwavering support of her daughters and the assistance of an unlikely business partner, Sydney discovers that her greatest adventure might still be to come . 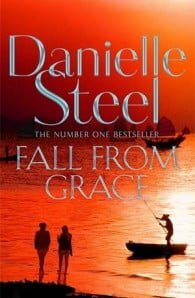 . .
Fall From Grace is an inspirational story about turning to family in times of trouble, by the world’s favourite storyteller, Danielle Steel.